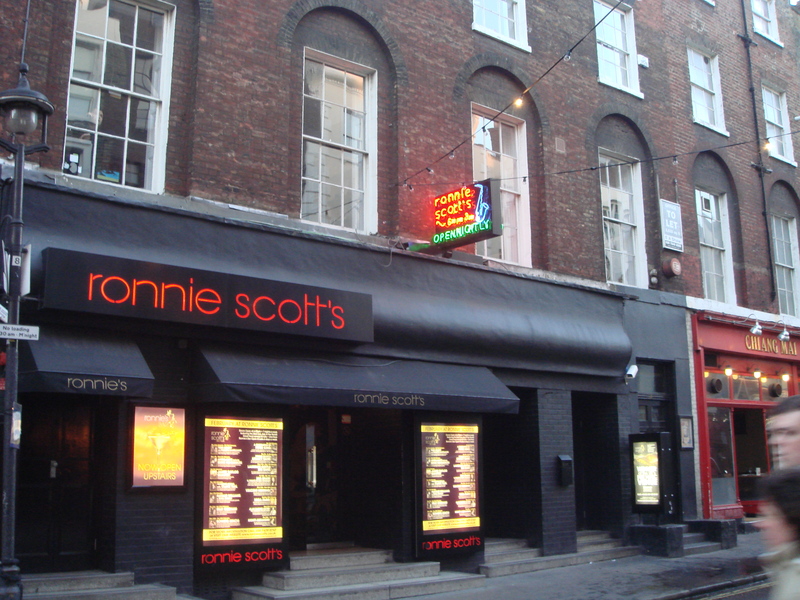 Although we booked a week in advance for Ronnie Scott’s jazz club in Gerrard Street, Soho, London, there were no tables left for either the 6p.m. or the 11 p.m. show. This was not surprising. The band of the night, the Ronnie Scott Legacy Band, rarely performs and the club is always heavily booked. So for 20 pounds we reserved places “at the bar” or “on the side”. Imagining a rush for a few square inches of standing room in mosh-pit crush, or two inches of elbow room at the bar, we arrived ahead of time and with a sizeable queue of other early-birds, ran the entry gauntlet. First we passed the front door security where our names were checked against the guest list and we were warned off using phones and cameras, then through the cloak-room check-in, then through a reception team, where our names were checked against another list and lastly to a charming waitress who showed us to our places “on the side”. Low ceilinged, dim and small, the club has the feel of the classic jazz basement but with none of the smoky closeness or the worn, shabby look. Ronnie Scott’s is chic, plush, hip and very, very cool. Its colours are black and red with the occasional hint of chrome. The dark walls are hung with black and white photos of the stars and superstars who have made Ronnie Scott ’s an icon among music clubs. There are two semi-circles of tables, lit with red lamps, at the centre of the room, close to the stage. At the back of the room, the bar is small and discreet with low lights and tones. The seats “on the side” are tiered in rows, behind benches, also lit with red lamps, for drinks and for those who choose to dine. 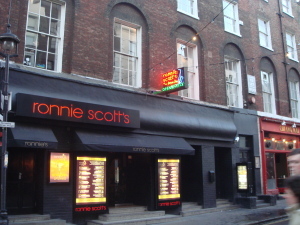 Ronnie Scott’s offers two menus, one for each show, and three courses. The choices are good, with four or five options for entrees, mains and desserts. The dishes we chose (the cod and the duck) were excellent. The wine list looked tempting but we by-passed it for the cocktails, which were simply irresistible. The Fitzgerald and the Mojito, each with a little cube of absinthe soaked sugar fizzing away in their depths, tasted delicious and were very potent. The evening’s support band, the Ronnie Scott All Stars, consisting of drummer, bass player and a brilliant pianist/vocalist, were very, very good – a powerful build-up and a great lead-in to the main performance. The audience was peppered with people who looked as if they might well have been around in the days when the club was a basement in Gerrard Street and snippets of over-heard conversation behind and beside us suggested that most were devout fans of jazz and of Ronnie Scott. The anticipation was palpable and the sense of occasion awesome. When the Legacy Band appeared, there was a roar of cheering, whistles and long applause. With Mark Fletcher on drums, Tim Wells on double bass, Pat Crumley on Saxophone and that stalwart of so many of Ronnie Scott’s own quartets, octets and combos, John Critchinson, on the keyboards, the music was magnificent. In a voice that is cultured English at its smoothest and, yes, sexiest, John Critchinson introduced the band and the numbers, reminisced just a little, tossed out some of those one-liners and asides and re-told some of those old jokes that Ronnie Scott was famous for. For everyone, club debutants and old lags alike, the magic of Ronnie Scott’s the club and Ronnie Scott the man was alive again.